Perhaps round is most common, but the triangle tube packaging container is particularly unique. 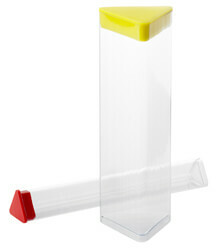 It will not roll off a shelf and clarity is the same as a round tube container package. These are made of three components beginning with an extruded clear tube then adding a clear bottom insert, permanently attached to create a clear container with a 360° view. Just add a plug and the triangle packaging container is ready to show off and protect your product.